Outdoor grilling is as popular as ever in the Rio Grande Valley, with greater numbers of people taking it well beyond simply firing up a gas grill or charcoal pit on the back patio to cook steaks, ribs, chicken, vegetables and more. A fast-growing segment is expanding their options to install outdoor kitchens, some of which are as well-equipped as the indoor versions. 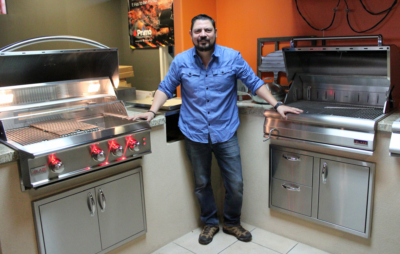 It was about seven years ago that Castillo set out to build an outdoor kitchen in his home. He could not find a company to design and build the kitchen, so he did it himself. That was the genesis of what would become Grill Street. 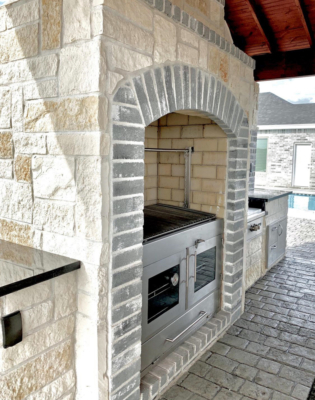 Grill Street carries about 15 brands of grills, smokers and other equipment like refrigerators and wine coolers that can be installed in a custom-designed outdoor kitchen. 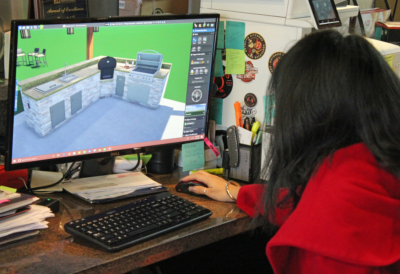 Castillo and another architect use 3-D design software to create outdoor kitchen layouts to fit a variety of spaces and budgets. Castillo said he sees people who have constructed an outdoor space for cooking and entertaining, and then come to his store to buy equipment. The problem with that can be a sometimes rude awakening when the equipment doesn’t fit the space in a functional and aesthetic way. 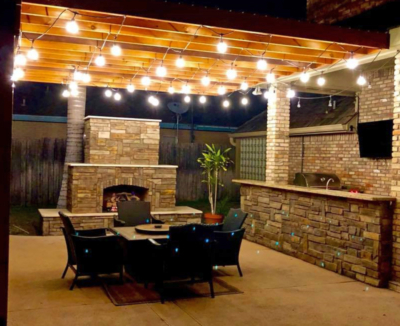 Castillo’s Grill Street installations may include features like a concrete or tile patio area with counter spaces designed for specific cooking equipment and accessories, all under a custom-designed pergola with lighting to make the space inviting after dark. Grill Street handles the design and equipment in-house, and subcontracts the construction phases. The result is a permanent addition that adds value to a home as well as creates an ergonomic social gathering place. And it is an investment on the part of the homeowner. Grill Street serves the Valley with outdoor kitchen installations from Rio Grande City to South Padre Island. Castillo said he will help people from out of the area design a kitchen, with the customer taking on the responsibility of hiring contractors for the build-out. After five years in its current location, the Grill Street showroom is crowded with grills and other outdoor cooking amenities, and boxes with new deliveries are stacked in what little floor space is left. 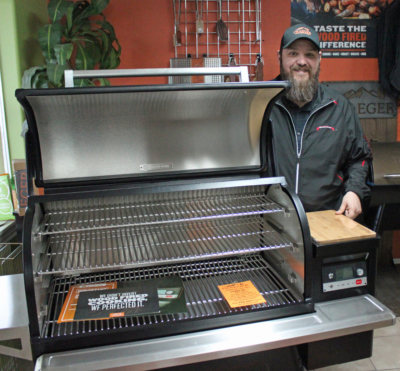 From time to time, Grill Street hosts classes on outdoor cooking, a service Castillo said generates more interest in outdoor kitchens and helps his customers become more confident in their skills as home chefs. The classes are something Grill Street has in common with South Texas Outdoor Kitchens, another Valley business dedicated to outdoor cooking. 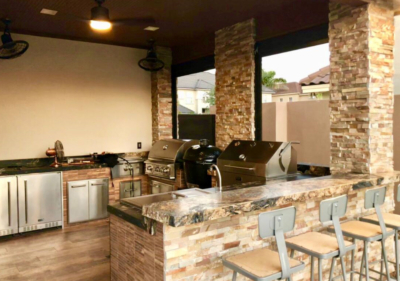 With locations in Pharr and McAllen, South Texas Outdoor Kitchens offers a wide variety of cooking equipment, although it does not provide design and construction services. 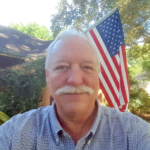 A family enterprise established by the Cardenas family, the business started out as Backyards Unlimited, selling primarily outdoor items like swing sets, trampolines and basketball goals. As Rick Cardenas, the founder’s son, began to take over from his father, he shifted the business’ emphasis to outdoor cooking.